Frankly unless huge magic or munitions are part of the mix I would use the moving dungeon aesthetic for truly giant creatures... Like shadow of the collosus... Each movement phase presenting different challenges and hazards. If you haven't already, you may want to check out the scale rules in Fudge. They're pretty flexible and straightforward. i like treating giants like traps--- and by giants here i don't mean 10' tall, i mean 50'. there is really no hope in killing one with weapons on hand like your spear, so no need to fill with a stat block. just invent some "one time" rules. like say for X giant, a saving throw or dex roll to avoid getting stomped. some series of things you have to do to climb it. things to avoid while climbing (stealth roll?). then some sort of rule about getting the exploding gem inside the ear. some rules about blinding. This is exactly the approach I've been taking with InBetween. In InBetween the characters are tiny mouse-like creatures less than an inch long. Most things are bigger than them. Some thing are much bigger. When they fight bigger things I use the normal rules, when they fight much bigger things then it is more like making saving throws to suffer less awful consequences. So if you have the "a cat is trying to get its paw under the cupboard you are hiding under" situation, then it is essentially "Take 1 Afraid damage, and roll X or take 2 Hurt as well", i.e. you can't win that encounter, and you aren't rolling against it in the normal sense, you are just surviving. the "a cat is trying to get its paw under the cupboard you are hiding under" .... "Take 1 Afraid damage, and roll X or take 2 Hurt as well",... you can't win... you aren't rolling against it in the normal sense... just surviving. This kind of approach is simple and flexible. I have a lot of sympathy with it, although I have never quite had the courage to adopt it myself. I guess the OP's issue is the possibility that PCs might be of very diverse sizes, and the rule needs to provide a consistent way of 'scaling' all of those different PCs against the possible diverse sizes of the foes. I really like what kenco, eeldip, and -orestes said. I don't often use any gigantic or large characters when I run games because it's such a boring fight. The rules treat it like any other battle, and larger characters are easier to hide from (ala the idea of letting PCs hide more easily from larger creatures) and can't fit into tight spaces, so getting away can be a cinch. They are big, epic encounters that should provide players with a sense of tension, awe, and no small amount of dread. I like the idea of using reflex saves to avoid a giant's punch, and I like the idea of treating them as traps. Here's my suggestion. I'd treat them in a manner similar to how Pathfinder treats chases. Say the character are fighting a gigantic demon or devil or similarly dangerous enemy. Though the PCs can take the fight to him up close, their attacks and actions are less about injuring the demon (because, in truth, a 20-foot-tall creature probably wouldn't even feel a halfling's short spear) and more about manuevering the demon through guile and harassment into an advantageous position. Take what would normally be a combat situation and, instead, turn it into a series of skill tests that utilize non-combat skills. Don't just make the giant an encounter, make the giant an entire scenario. This provides characters with solutions that do not revolve solely around combat. Perhaps the main group tries to maneuver a giant to a cliff where the rogue and the ranger are waiting overhead to push a big boulder on top of him. Maybe, during a battle, a wizard summons a devil and the PCs have to run up to the battlements to use siege weaponry against it, all while being pelted with fireballs. Maybe a particularly daring character drives a carriage into the giant's legs at full speed in order to make him fall down, giving the others time to run off and hide. I really like where you're going with this. Part of the issue with 10' giants is that, in any world with realistic anatomy and physics, they should be slow-moving and incredibly weak, barely able to support their own mass. And conversely, if they somehow did have the anatomical features needed to move much like regular humans, just bigger...it becomes kind of questionable how much of an effect weapons made to be used primarily on humans and comparable lifeforms would still have. I mean, at that point we'd be talking extra-tough bones and connective tissues, muscles more powerful than anything we're used to and who knows what I'm just not thinking of at the moment (though doubling up on some vital organs just to keep up with their bodies' and metabolisms' increased demands does also come to mind easily enough on reflection). Of course, that straight-up comes down to how much we really want to subject our fictional giants to the square-cube law. There is also plenty of traditional precedent for not taking a strict "hard science" approach to them, after all. Yep. That's part of the reason I feel free to play giant humanoids as creatures from folklore, rather than from reality. 10' i guess is the "our world" ape size limit. 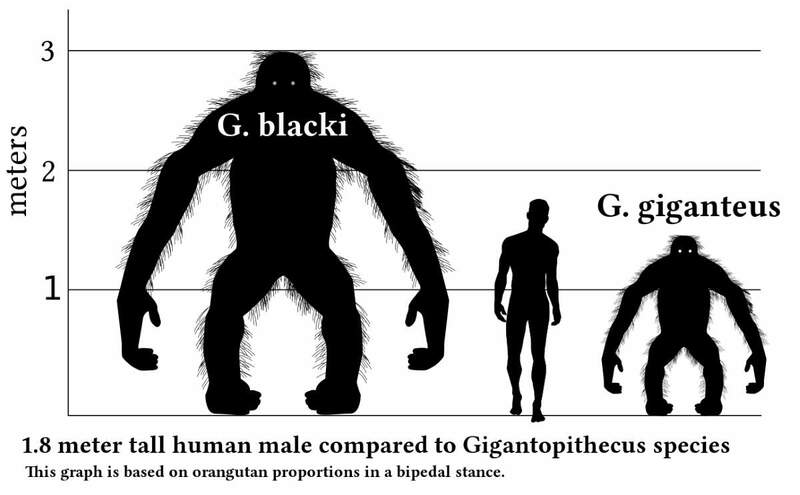 so its not THAT far fetched to have an animal in our genus of that size. i think its realistic in some sort of game where it is assumed that game physics map 1:1 to our physics. WHOA, sorry for the giant image. The biggest danger for gigantic creatures is failing over or falling. Elephants cant handle a jump or 4 cm pit. Lots of T rex deaths were suspected to be hitting things with brutal injuries and falling. Without a gun, it is suggested you fight a T Rex with a tangling net.